As a first class binary options broker review, GFM Trader serves as the best medium for anyone who intends to join the marvelous world of binary options trading. It’s simple, practical, and easy-to-use even for beginners. This platform’s attractive features have earned it a positive reputation among the industry. With over 35 years of experience in the global financial markets, this broker’s team of business professionals makes GFM Trader review uphold its value of providing quality service to all of its traders. 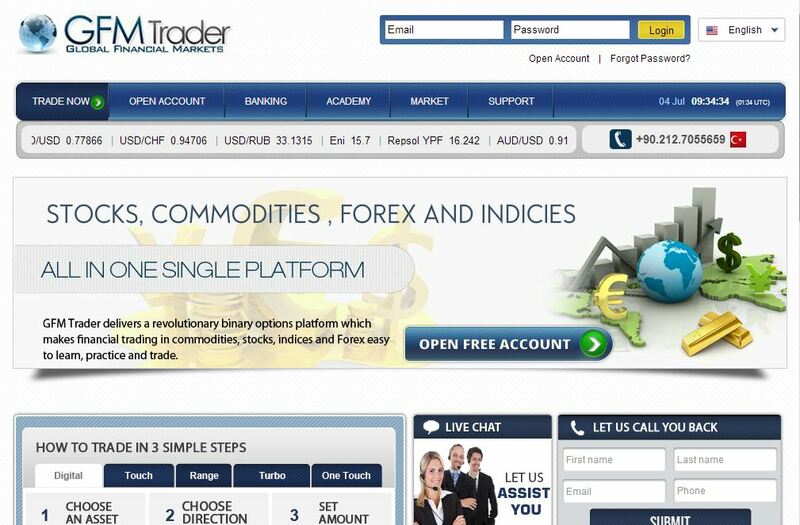 GFM Trader offers a range of account types based on the trader’s preferences. These types are the Mini, Standard, Trader, Pro Trader, and Investor accounts. All types come with a free e-book, which provides insights and some helpful tips on trading binary options. At GFM Trader, users can select from four trade types, namely 60 Seconds, Touch, High/Low, and Range. Though its asset index may be limited as of the moment, this broker continuously makes efforts to expand its assets, so that trader can have more choices to choose from. Its available assets include 11 currency pairs, 10 stocks, 7 indices, and 4 commodities. Users can trade hot stocks such as stocks from Google, Coca-cola, and McDonald’s. Moreover, users with Pro Trader and Investor accounts get exclusive access to a certain technical asset analysis from GFM Trader’s partner firm, Meydan & Co. There are also helpful functions offered by GFM Trader like the Close Trade, Extend, and Double functions. With Close Trade, users can end a trade even before the expiry time in order to prevent loss and take slight profit when a trade starts moving opposite the way you want it to. On the other hand, the Extend or Roll Over function enables traders to extend the expiry time of an option, hoping that the option would move favorably if it’s given more time. Lastly, the Double function allows traders to duplicate a position if they find the market moving in favor of their prediction. This lets the user earn double the profit as well.